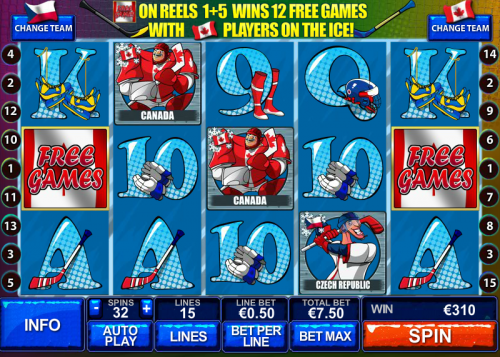 Online slots based on sport are not too difficult to find, especially if you’re looking for something based on football; an ice hockey-themed slot is a rarer thing though. 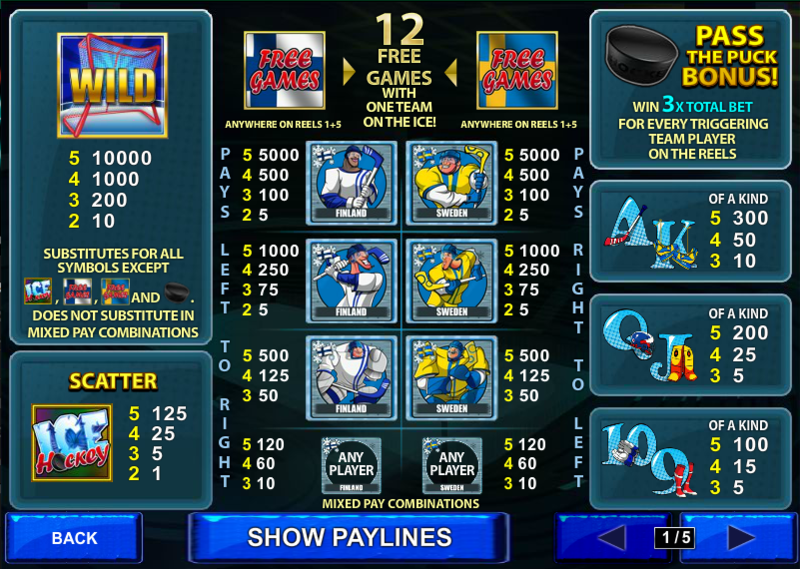 Fortunately Playtech‘s Ice Hockey game does it’s sport proud and brings us a great-looking slot with several bonus features. There are five reels and just fifteen paylines and when you first start playing you’ll be given the option to pick which teams will play each other – why this is important is explained in the Bonus Features section. The low value symbols are all playing cards adorned with ice hockey paraphernalia while the higher value symbols are characters from the teams you have picked. Special symbols are a Puck, an Ice Hockey logo, a Net wild symbol and a Free Games symbol. Once you’ve picked the teams you’d like to face off against each other you will notice that all the characters on the reels are from one of the teams. The home team will create left to right combos while the away team form them from right to left. There will also be two Free Games symbols, each featuring the flag of one of the countries. If you manage to land two of the Free Games symbols of the same flag on reels one and five you’ll receive 12 free spins but the good news is that all the players will be from just one team, greatly increasing the chances of making winning combos. Wins can be formed from left to right and right to left. Check the video below to see what happens in this bonus game. The Puck symbol can appear on reels two or four and to get you a bonus it needs to land to the right of one of your home players (on reel two) or to the left of one of the away players (on reel four). Manage that and the puck will bounce to each of that team’s players on the screen, earning 3x the total bet for every one it touches. There’s loads to enjoy in this slot, from the ability to pick your teams (although only nations that are good at ice hockey are featured) through to the inventive bonus features. The music may get a little repetitive but you can always mute that. Betting is from €0.01 per payline up to €75 with everything maxed out.